This Generation OM from Bourgeois has the power and maturity of a far older guitar yet is waiting to go to a good home for it's first songs! 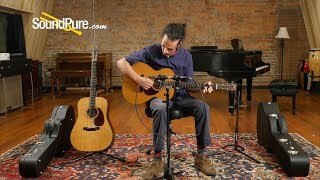 If you want a medium body acoustic guitar that will handle picks and fingers with ease and feel great while doing so then this is worth considering. We've got an aged tone Sitka top here that looks as good as it sounds and some really nice mahogany on the back and sides that results in a strong fundamental sound of the guitar. If you want power and punch in a super comfortable body shape, then check out the new Generation OM from Bourgeois! 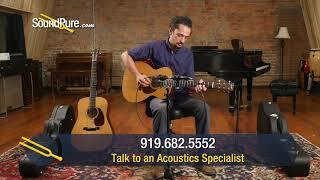 In this video, Sound Pure acoustic guitar specialist Barrett Brooks plays a Bourgeois Generation Series OM acoustic guitar. Some players plug in regularly, some plug in occasionally, and others not at all. To accommodate the widest variety of player preference we've designed an out-of sight, out-of mind pickup installation that facilitates the plugged-in option when you need it and only when you need it. And the best part: Plugged in, it sounds recognizably and refreshingly like its acoustic self.